Very often on the sole of the iron formed nasty plaque that is difficult to clean and which prevents stroke. This issue is due to the fact that you ignore the temperature that the manufacturer recommends. Remember that for silk and synthetics should not heat the iron too much, and woolen things are best ironed with a hot iron through gauze soaked in water. If you got the task to clean iron from scale, to clean the iron in several ways. One of the modern methods that will help you to cope with this problem is a special pencil that is designed to clean the soleplate from scale. You can buy it at the hardware store. Using them is easy and convenient. Heat the iron, RUB the sole with a pencil and wait for the contamination on the surface will start to melt. Then wipe the sole with a dry cloth and let the iron cool down. Then wash it with clean water to remove any residual chemical reaction from the surface of the sole. When touching a pencil and a hot iron formed a sharp unpleasant smell - the evaporation of ammonia. Try to follow safety rules, don't forget to wash your hands after you are done. To clean the iron, you can use the old method. Sprinkle on the newspaper a big mound of salt finely ground and slide the iron like iron. Try to press harder on the iron, the salt is squeezed out from under the soles, and the iron touched the paper. You will see that the newspaper and the salt will be dark - so the iron had to brush. If the dirt on the iron went not all, then heat it again and repeat all over again. 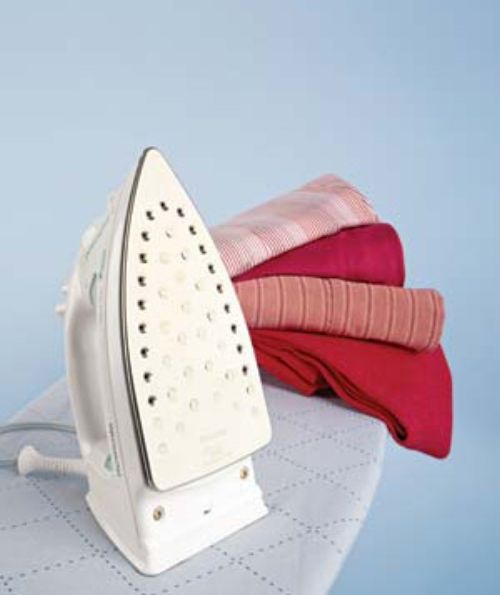 This method will help you to clean the iron thoroughly. After the iron has cooled, wipe the soles with a damp cloth, then dry. Another simple way to help you clean the iron. Grab a soda, dilute it with a small amount of detergent to form a slurry and apply with a sponge onto the sole of the iron. Try to RUB the surface intensively and long lasting. Then leave the iron for a while, so the sole is soaked in this composition, only then rinse the iron with water and wipe with a dry cloth. When you clean an iron in a similar way to heat it is not necessary. There is another popular method to clean iron is vinegar. When nothing at home, you can use this method. Take a rough cloth (an old towel), wet it with vinegar and RUB the composition into the surface of the sole. If you fail to clear the iron from the first time, then repeat. The vinegar fizzles out quickly, so soak the cloth often as possible. After you clean the sole of the iron, heat it and iron useless rag. Now your iron will be clean. If the surface of iron rust, so you fill it with cold tap water, and do not do this. Use only distilled water, due to its chemical properties it forms limescale inside the iron. To get rid of the rust, fill the iron with water with a descaler (half a teaspoon in a glass of water), heat the iron and let it stand for 20 or 30 minutes to scale behind, and then wash it. Now I can safely use an iron and not be afraid that linen will appear rusty spots. Many Housewives, to get rid of rust, use a cleaning Silit. This is done so. Warm iron, turn it sole up and apply the product directly into the holes. Wait for 5-10 minutes and you will see how the dirt will come out of the sole. Collect the dirt with a sponge, carefully select it from the holes in the soles, and then rinse with warm water and wipe with a dry cloth. Now can iron absolutely pure iron.